Who doesn’t love a nice soft, moist cupcake from the little bakery shops? These cupcakes are so light and moist, and yet so full of flavor. So why buy just one cupcake when you can make a whole batch. Now is the perfect time, these of course are amazing cupcakes year round, but something about them just seems to fit the holiday season. Bake pecans in a shallow pan at 350°, stirring occasionally, 8 minutes or until toasted. Cool completely. Process 1/4 cup pecans in a food processor until finely chopped. Set aside. Beat butter at medium speed with an electric mixer until fluffy; gradually add 3/4 cup granulated sugar, beating well. Add egg yolks, 1 at a time, beating until blended after each addition. Stir in vanilla bean paste. Combine flour and baking soda; add to butter mixture alternately with buttermilk, beginning and ending with flour. Beat at low speed until blended after each addition. Beat egg whites at medium speed until soft peaks form; add remaining 1/4 cup granulated sugar, 1 tablespoon at a time, beating until stiff peaks form. Fold one-third of egg whites into batter; fold in remaining egg whites and 1/2 cup toasted pecans. Spoon batter into paper-lined muffin cups, filling two-thirds full. Bake at 350° for 22 minutes or until a wooden pick inserted in center comes out clean. Cool in pans 5 minutes on a wire rack. Remove from pans, and cool completely. Combine reserved 1/4 cup finely chopped pecans and brown sugar in a small bowl. Spread a generous 2 tablespoons Browned Butter Frosting onto each cupcake. 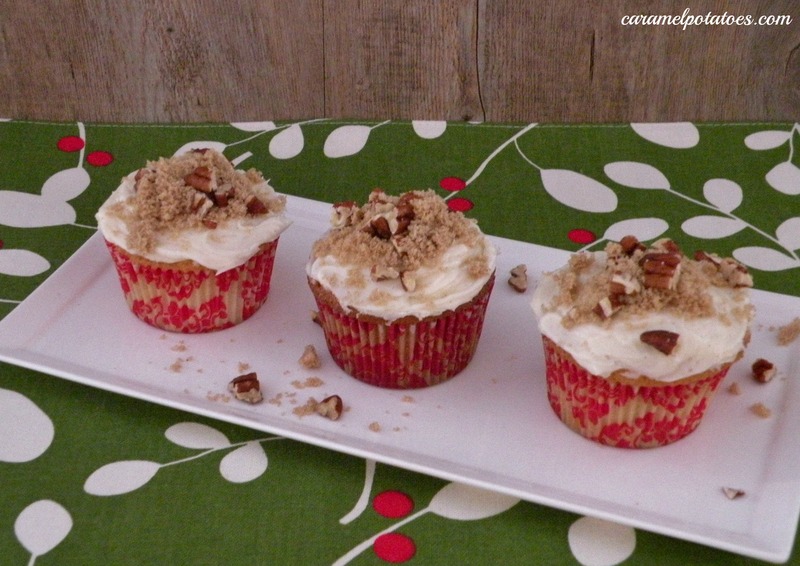 Sprinkle tops of cupcakes with pecan-sugar mixture. Cook butter in a small heavy saucepan over medium heat, stirring constantly, 3 to 4 minutes or until browned. Transfer to a large mixing bowl, and cool 20 minutes. Add cream cheese to browned butter; beat at medium speed until smooth. Gradually add powdered sugar, beating until light and fluffy. Stir in vanilla bean paste. Note: Vanilla bean paste is recommended for this recipe. It has a speckled, syrupy consistency. I buy mine at Williams-Sonoma, but I am sure other cooking stores carry it. If you want to substitute vanilla extract for the paste you may.